Latest Design Option 6, Photo 6 » Roger Perron Inc. 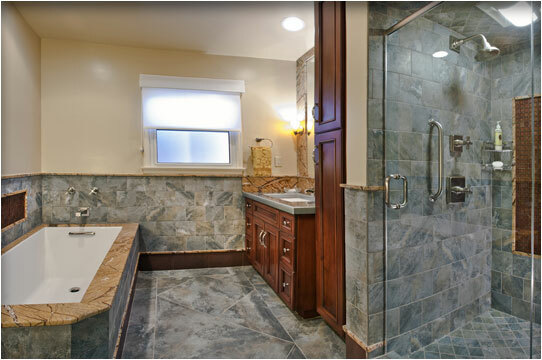 This bathroom remodel has a unique blend of tiles and granite, providing a traditional feeling. The granite cap and mirror surrounds, with tub cap, complement the tile and create an interesting combination. The counter is made from gray-colored porcelain, a Kohler product. The floor tile was set on a diagonal with the same material border, while the cabinet stain and mosaic tiles balance the color in the room. Design for this front porch addition and home remodel in Burbank was created by Roger Perron, design-build general contractor, with contributing architect for working drawings Curt Sturgill.